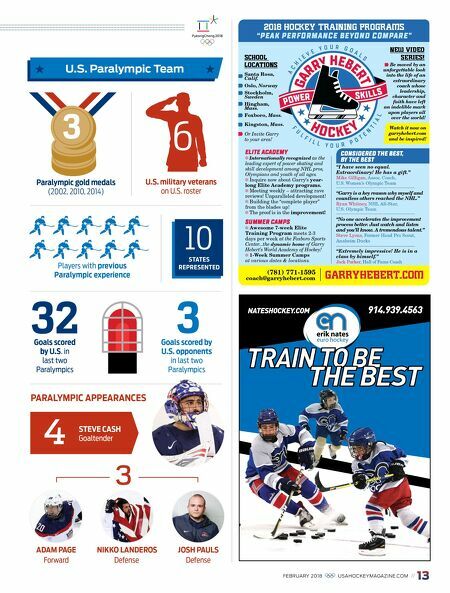 3 U.S. Paralympic Team Paralympic gold medals (2002, 2010, 2014) FEBRUARY 2018 USAHOCKEYMAGAZINE.COM // 13 10 STATES REPRESENTED PARALYMPIC APPEARANCES Players with previous Paralympic experience 6 U.S. military veterans on U.S. roster Goals scored by U.S. opponents in last two Paralympics Goals scored by U.S. in last two Paralympics 3 32 4 3 STEVE CASH Goaltender Forward ADAM PAGE Defense NIKKO LANDEROS Defense JOSH PAULS "PEAK PERFORMANCE BEYOND COMPARE" "Extremely impressive! He is in a class by himself." Jack Parker, Hall of Fame Coach "I have seen no equal. Extraordinary! He has a gift." Mike Gilligan, Assoc. 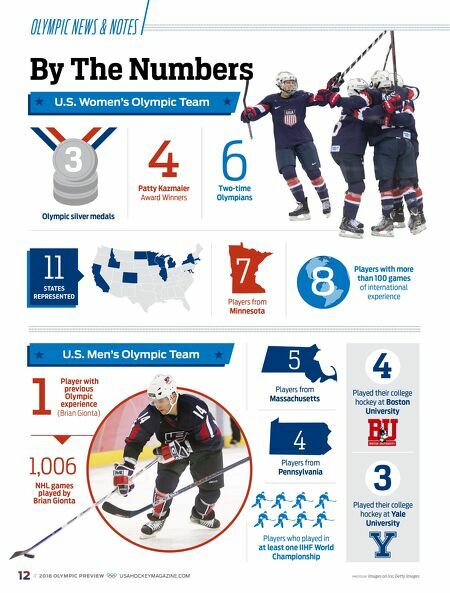 Coach, U.S. Women's Olympic Team "Garry is a key reason why myself and countless others reached the NHL." Ryan Whitney, NHL All-Star, U.S. Olympic Team GARRYHEBERT.COM (781) 771-1595 coach@garryhebert.com G A R R Y H E B E R T A C H I E V E Y O U R G O A L S H O C K E Y F U L F I L L Y O U R P O T E N T I A L POW ER S K I L L S CONSIDERED THE BEST, BY THE BEST SCHOOL LOCATIONS Santa Rosa, Calif. Oslo, Norway Stockholm, Sweden Hingham, Mass. Foxboro, Mass. Kingston, Mass. Be moved by an unforgettable look into the life of an extraordinary coach whose leadership, character and faith have left an indelible mark upon players all over the world! "No one accelerates the improvement process better. Just watch and listen and you'll know. A tremendous talent." Steve Lyons, Former Head Pro Scout, Anaheim Ducks ELITE ACADEMY Internationally recognized as the leading expert of power skating and skill development among NHL pros, Olympians and youth of all ages. Inquire now about Garry's year- long Elite Academy programs. Meeting weekly – attracting rave reviews! Unparalleled development! Building the "complete player" from the blades up! The proof is in the improvement! SUMMER CAMPS Awesome 7-week Elite Training Program meets 2-3 days per week at the Foxboro Sports Center...the dynamic home of Garry Hebert's World Academy of Hockey! 1-Week Summer Camps at various dates & locations. 2018 HOCKEY TRAINING PROGRAMS NEW VIDEO SERIES! Or Invite Garry to your area! Watch it now on garryhebert.com and be inspired!